With Download’s expanded 2nd lineup announcement. We take a sneak peak at the current top 5 artists that will be warming up the stages at Download Festival 2019 in Australia this March. Why you should see them? ‘Utimo is buzzing with energy and typically interacts with the crowd in the mosh. Off the back of their sophomore album “Purge” they should be cooking up a fierce performance to the early comers. Hailing in from Hobart, Tasmania. Luca Brasi will be a softer punk band to sing to. Having shared their scene with Violent Soho, The Smith Street Band, DZ Deathrays. “Collisions”, our personal favourite off their latest effort, is reminiscent of Wonderwall and throws us back to similar mid 90’s anthems. To be honest. These next two are based on a rushed first listen and we wanted to save our top pick for last. No new tracks to listen to here (latest release, 2016) and that does not detract from their current discography for a 2019 festival. Giving our ears to Twelve Foot Ninja’s top tracks, we would be eager to see their reggae influences blended with a heavier metal. We love the Bikini Kill vibe here, although it is a more aggressive kind of punk that you would except on a lineup like Download. Flying over to Australia for the first time, after an eager and long wait to see them down under. Our hopes were severely shattered that their first sideshow announcement did not include an appearance in our home town of Melbourne. We can only hope for more announcements soon. First witnessing the band in May 2017 @ Liverpool Sound City, we experienced them at various gigs in England throughout the remaining stay. The duo have a strong presence on stage, backed up by a featured guest vocal from Mike D (Beastie Boys) on their album 3rd LP “Take Control”. The Englishmen will be bringing with them their latest record “Acts Of Fear And Love" which concluded the year as one of our top albums of 2018. Ahead of their appearance at Download Festival, Australia, 2019. 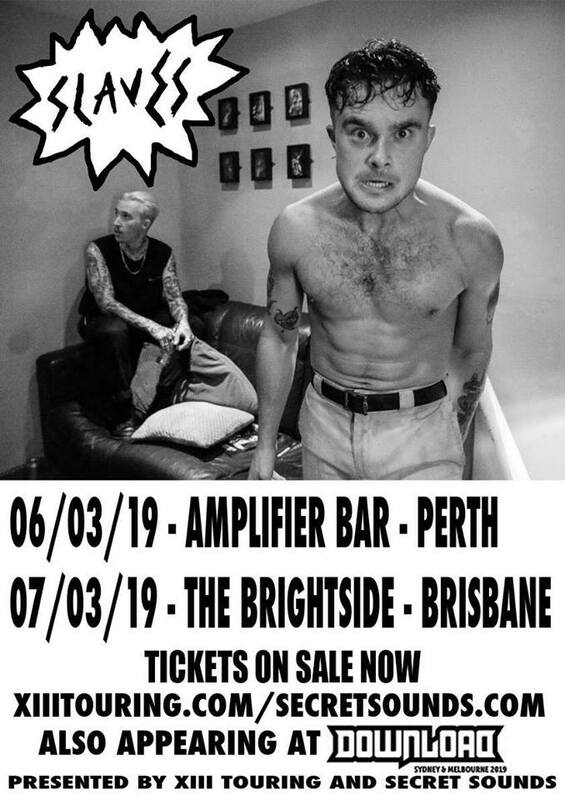 Slaves have announced their first Australian headline shows in Perth and Brisbane before exclusive sets at the festival for Sydney and Melbourne fans. We only hope that the duo announce a last minute sideshow in our local home of Melbourne. ALL AGES* | NEW SHOW! Last night, Thursday, 24 January 2019. IDLES invaded the Corner Hotel in Richmond kicking off their epic debut tour in Australia. 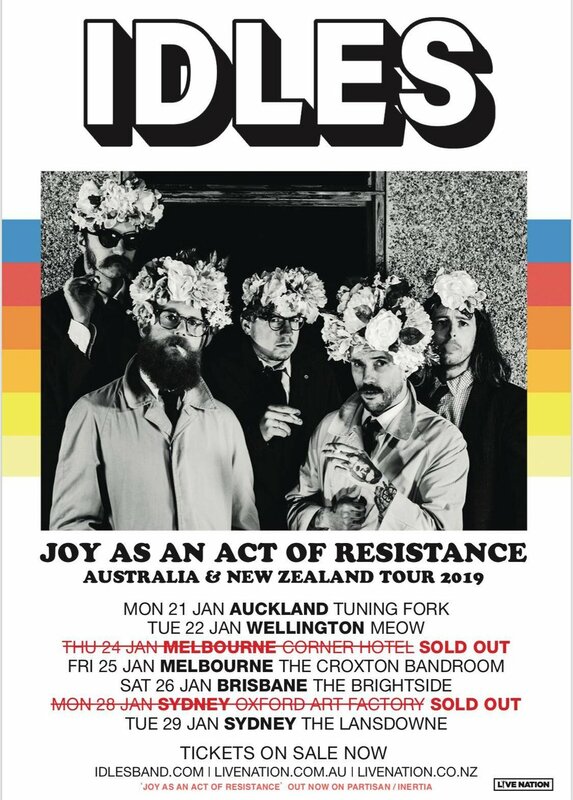 IDLES Announce Debut Australian Tour for 2019! Last night at Cherry Bar, The Neptune Power Federation performed an empowering and ritualistic set supporting Black Aces.